Not much to show today. I spent a good deal of time working on some dice simulations/modeling. My goal was to think about how students might write a dice simulation in various languages and how one could facilitate understanding/learning about the underlying principles involved in dice simulation along with the concepts and ideas that can be explored in this process. 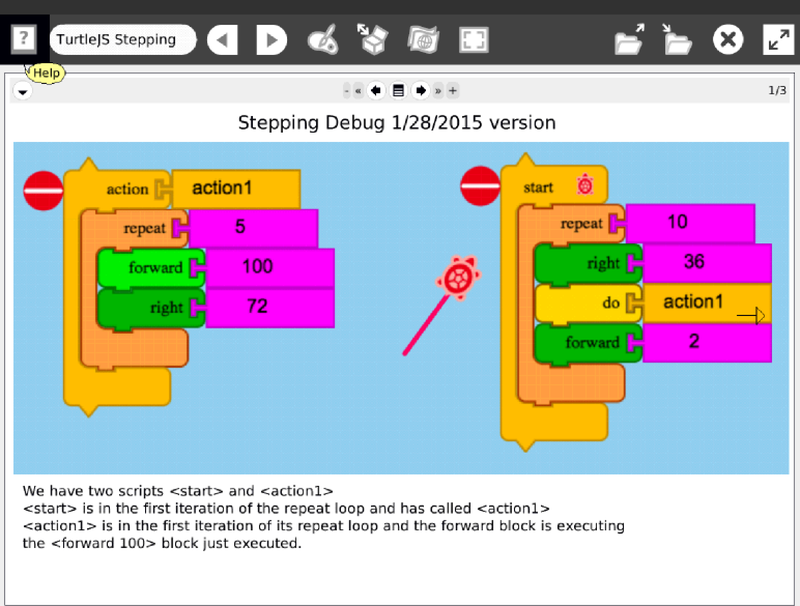 I looked at dice simulations in Scratch, TurtleArt and Python. I also explored ways I could create dice simulations in Etoys. As I mentioned in an earlier post I find "step by step" execution useful for not only teaching, but also for myself when the code doesn't do what I think it should. I also played with various ways to write the simulation. Partly to think about how kids might do this. Side note - I found it really hard to overcome my pre-existing knowledge as I instantly went to more "advanced" ways of implementing simulations, rather than ways a novice might start out. I also tried various approaches to think about how to create some "good examples" that students can learn from. Post Script - Another way to think about simulations check this Scratch Studio - "Just like real life!" a more "real world" way kids think about simulations/modeling. Too busy with work, which takes a large cognitive load, so at the end of the day I need diffusion/space out time. Focused thinking after a day of focused thinking is hard. Spaced Learning - Well I finally started trying this by re-watching the AngularJS videos and thinking about why they do certain things and what problems they are trying to solve, etc. Pomodoro Technique - Well total failure in applying this. But this week I will do it. Don't just glance at it and think you know - I am recongizing this problem and admitting it to myself. Part of the reason I am re-watching the AngularJS videos is to not only for spaced learning, but also to try and get a deeper understanding. Use different problem solving techniques - Well the lessons did go through various ways to produce the same HTML and behaviors, so I could see the advantages of directives and controllers. Yet, it would be better to compare to completely different ways to solve similar problems. Powers of 10 thinking - I just do this naturally, but again too much time in the clouds trying to generalize and not enough going down deep. Well figuring this is a Learning Challenge I signed up for the Coursera course: Learning How to Learn: Powerful mental tools to help you master tough subjects. Unfortunately I just got back late this afternoon and the first quiz was due this week. Fortunately I was able to watch all the videos and pass the quiz. That said I violated one of the principles which is "not to cram" but to do spaced repetitions. So I will try and go back over the week and review what they taught. Completed Shaping up with AngularJS course. Forcing myself to do this everyday has been a challenge, mostly because we are on vacation. I may skip a day or two as we are now in Orlando. Continuing with AngularJS at CodeSchool. I sometimes get answers "wrong" because I added or am missing an extra semicolon. This can be annoying and frustrating and it would be good if the "computer" would tell me visually (like some editors do). These are the kinds of things that can frustrate students and use up time and cognitive load better spent on other tasks. Now add to this from what I have read on recommendations "You shouldn’t put a semicolon after a closing curly bracket"
Of course any automated learning program that has to do checks will have issues as there is usually more than one right way to do things. Now, it seems Code School is looking for specific formats and commands which limits the possible "right" answers. But since there can be more than one way to do things it would be better to simply pass a set of tests and if they pass the tests you have solved the problem. That said in the cases I am seeing for Angular the "end result" is exactly the same, but they are trying to teach you a specific way to code so I can see why they check the way they do. I have also been thinking if Domain Specific Objects/Languages might be better approach for learning environments and also for providing ways for non-experts to "program" as part of expressing themselves and/or playing with ideas. But right now that is just an idea germinating lets see where it leads. Try Blockly!!! I tried it when it first came out and thought well, it has some potential but needs work. Well they did a lot of work since I last looked at it. The second is rather well done and the type of supporting documentation that students and teachers need. Plus it also does Logo see the Turtle example and it can be run Offline!!! First this is not a fair comparison, as Etoys was designed for this purpose and Angularjs was not. Yet I understand the desire to have a tool to that can be used for exploring ideas, communicating and expressing themselves. I also understand the request to have tool that can be used in a browser. There are lots of code examples one can learn from and play with on Plunker and JSfiddle. You have to spend a lot of time learning about AngularJS and how to do things in AngularJS which takes away from the time spent on learning/expressing/exploring. It is built around the Web in particular the DOM. Ie: you are restricted to what the DOM can do. Okay not completely true you can blow a hole in the DOM and using SVG or Canvas but the libraries available to do things here (think D3 et al) are very specific and require high learning curves. While the learning curve when compared to other Web Frameworks is not quite as steep, there is a steep learning curve for students especially if they do not have a lot of programming experience. It is a text based language (as opposed to a tile based one) which means syntactical errors are easy to make and take time and cognitive load to understand and correct. It supports tile based scripting and lets you switch to text based. It lets you directly manipulate objects and extend their functionality. The community to support learners is responsive and helpful. There are some good educational resources for students and teachers to explore. There is no large organization or funding supporting Etoys. The community while supportive and helpful is not large. Etoys currently does not run in browsers or on tablet or phones (Yes, I know it can and there are projects which show its possible, but there is no “supported” fully functional and fast enough version that does so for all “modern” browsers). Now to quote Seymour Papert “It’s hard to think about thinking without thinking about something.” So I will try to think about some things and how they could be done in AngularJS and Etoys (and perhaps some other ways of doing things). So at some point I will try and think about "something" more concrete. Ideas and suggestions welcome for “what to build”. Well coding while driving is not easy and since we spent most of the day driving my coding was limited to a few minutes just before I crashed at the hotel. I plan on creating the data structures, directives, and controllers to allow me to connect the data source to a visualization. Then the next step after that will be to think about and perhaps try to implement some simple user interfaces that allow a lively like drag and drop connection between the data-source and visualizations. I completed lesson 3 from Shaping Up With Angularjs. Since we will be driving to Florida over the next two days I will be thinking about code rather than writing it. I plan to think about how I can implement something like the lively demo using Angular. In particular how to "connect" a data source to a visualization and allow for converter code that is all in one place.